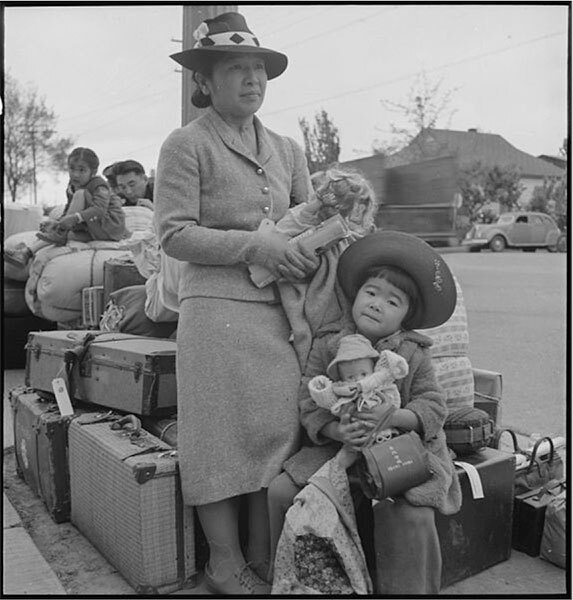 OMCA has opened a new Sent Away bay, giving the visitor a more visceral experience of the Japanese-American Internment. It has replaced the old bay which exposed the experience at Tanforan detention facility—euphemistically called Tanforan Assembly Center, and formerly the Tanforan horse racing track—where Japanese-American families were detained during WWII. In the original exhibit, the museum used the format of a stall to illustrate the crowded condition in the detention center, with two small rooms, each about 125 sq. ft. When you peeked into the dark stall an audio tape played. On the other side of the stall was a small room you could enter to see artifacts of that time. The artifact that has always been the most moving to me is a 3″ x 2″ woodblock suitcase with a leather handle made by a child’s father, Matsusaburo Hibi, in 1942, so that his daughter would have something of her own to carry. 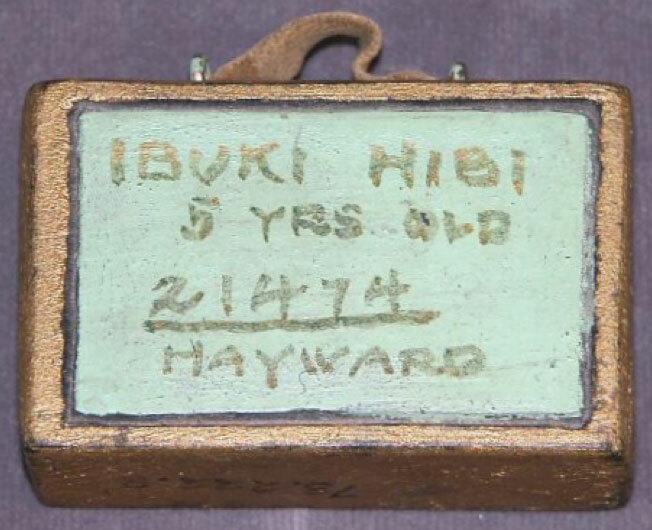 Ibuki Hibi, who was five years old, and her family were interned at the camp in Topaz, Utah. Child’s toy suitcase made out of a block of wood. 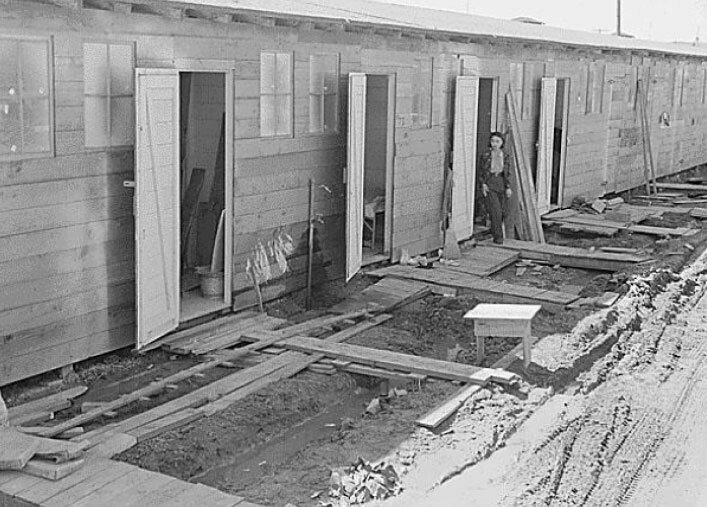 Topaz was one of ten permanent detention camps, where 120,000 individuals of Japanese descent were interned during World War II, including 11,212 Japanese Americans from the San Francisco Bay Area. This second room in the bay had signage on the walls, along with drawings and the woodblock suitcase. Many of the bays in the history gallery I can recall visually, but this one I cannot. I did not have the scaffolding of learning about this period of history in school. Several years ago, the Experience Developer assessed that the Sent Away bay did not provide an emotional experience. Although there were facts and artifacts to view, these did not give the viewer a feeling of the actual experience of the detainees. 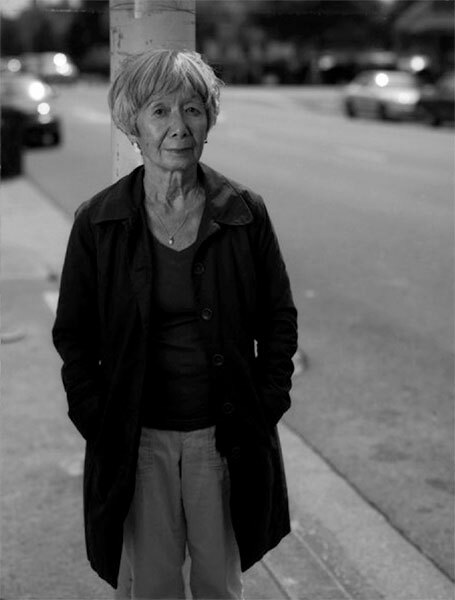 Ibuki Hibi Lee, 75, stands on the same location on “C” Street in Hayward, California where her family waited for a bus to take them to the Tanforan Assembly Center 70 years ago. Ibuki said, ” You have to think of camp from the view of injustice, and it was really an injustice to Japanese Americans and those that were citizens. It had to do a lot with economics, racism and politics.” SacBee photo by Paul Kitagaki Jr. The museum has a curatorial team for each of the galleries. There is a curator who researches the history and also gathers the artifacts to build an experience for the visitor. That person is Suzanne Fischer, PhD. There is also the Experience Developer, Christine Lashaw, whose focus is to create the visitor’s experience in the gallery. She is the “boots on the ground” person. The feedback she received from visitors and families whose members were in the internment camps helped to build the new Sent Away bay. Lisa Sasaki is the Director of the Audience & Civic Engagement Center at the museum. During a sneak peek at the exhibition on February 23, 2016, Lisa spoke about her family’s experience. As a child, Lisa knew that her grandparents were “in camp,” but she did not know what that meant. It was not discussed in her family until 1984, when President Ronald Reagan wrote a letter of apology to all the internees. Lisa explained that, prior to the letter, her grandparents did not want to talk because their government had done something terrible to them; they felt shame. This is not unlike what happened to Holocaust survivors who did not want to expose the numbers on their arms or talk about their war experience with their families. The new Sent Away bay is powerful in comparison to the prior exhibit. OMCA takes pains to be sure that all exhibits are the best they can be and this revision is an example of what one of the dedicated teams in the museum is capable of creating. This was an embarrassing choice for America to make, but there are some redeeming stories along the way. Jack and Simon were in charge of the shipping department and Irene was in charge of the wrapping and decorating at the store. Simon, a Jewish refuge, filled in for Jack, along with his own responsibilities. He insisted on doing so. It was sad for Simon to be without Jack and Irene for those four years. My family made sure that Jack and Irene kept their jobs when they returned home from the camps. Many years later, when I was a teenager, Irene taught me how to wrap presents in the store. I was so proud of my immigrant family taking care of these Japanese Americans. We were among many families who made a difference. Kristi Rasmussen, who is a docent here at OMCA, told me her family’s story, which is now my favorite. When Kristi was in high school in the ’60s, her grandfather died and she went to the funeral. 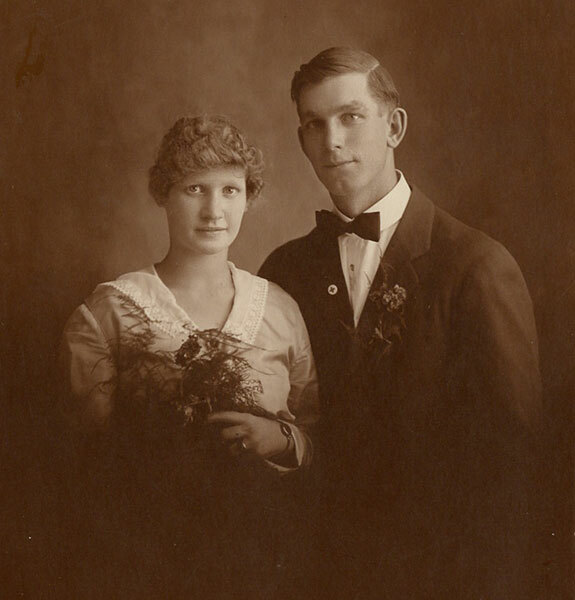 Kristi’s great-grandfather and great-grandmother were from Denmark and immigrated to the United States. They settled in Fresno County, California. 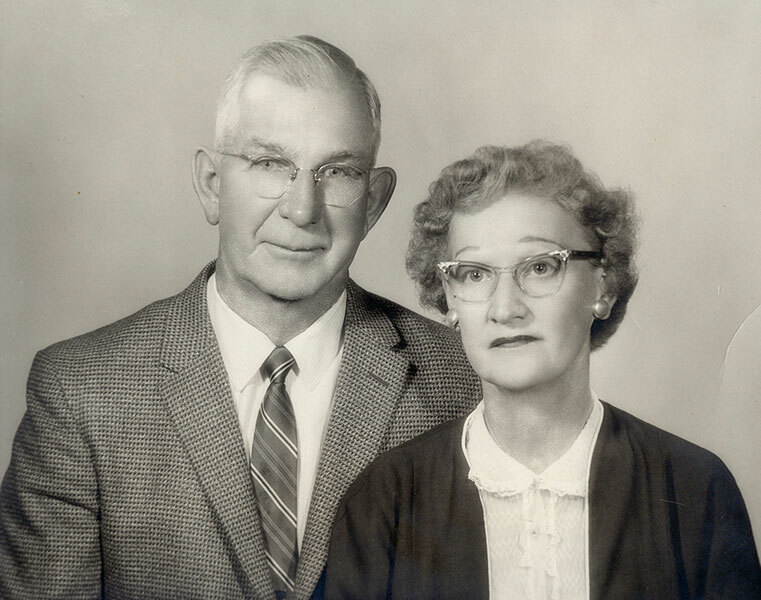 Kristi’s grandfather, Helmer Rasmussen, was born in 1898. He married the lovely Thyra Agathe Dagny Pedersen who was born in Denmark in 1902. When Helmer died in 1972, Jimmy Kozuki, a contemporary of Helmer’s, and his family came to pay their respects. The Kozukis were fruit growers and the Rasmussens packed all their fruit for market. It was then that Kristi learned of her fraternal grandfather’s role during the Japanese-American Internment from February 19, 1942–June 30, 1946. Kristi and her siblings, Lisa, Craig, and Bruce, were told that their grandparents had helped the family of Jimmy Kozuki during the period of the Japanese-American Internment. N.J. Kozuki, like Helmer, had a farm. His was in nearby Parlier where many immigrants settled—Japanese, German, Italian, Armenian and Scandinavian—and also raised grapes. When the Kozuki family were sent to the internment camps, Helmer told him that his farm would be cared for and returned to him when he came back, and told him not to worry. 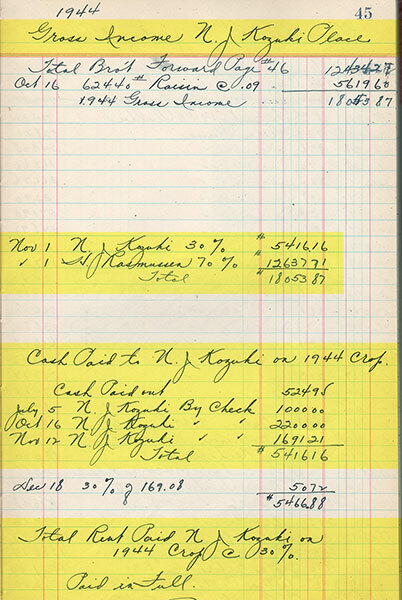 When Kristi was going through family records after her father passed away last year, she found ledgers from her grandfather for the years that he had cared for the Kozuki farm. 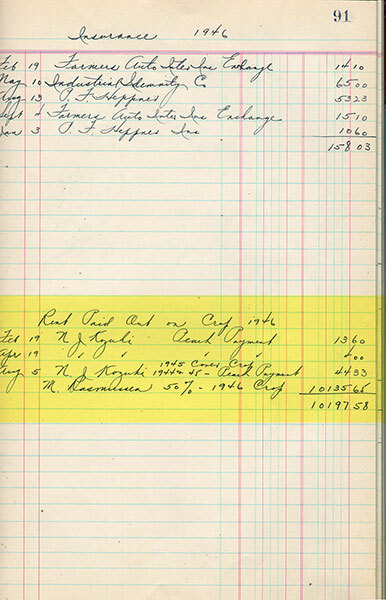 Her grandfather went to Heald Business school at night to learn how to keep track of the records for both farms. 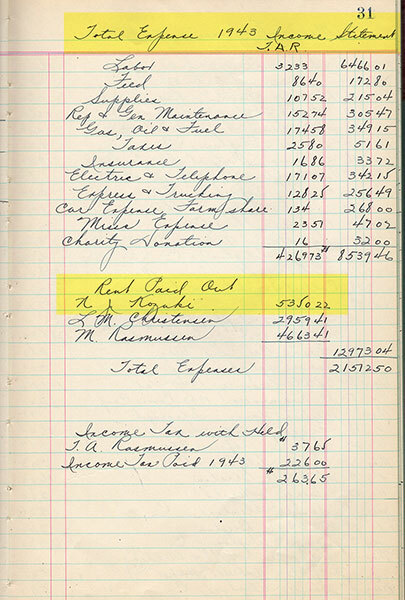 Page 21 is the first entry Kristi and I found detailing the gross income, beginning June 14, 1942. 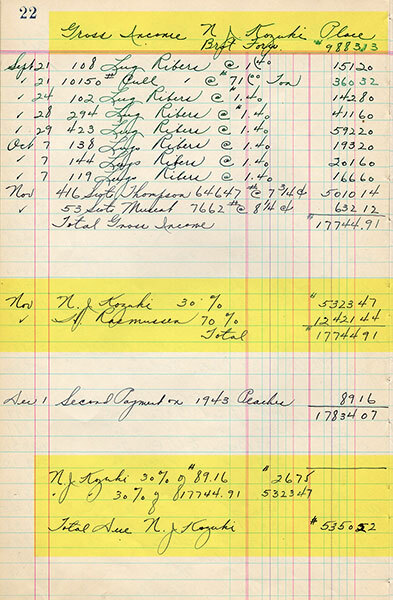 Helmer kept the Kozuki’s records right alongside his own. 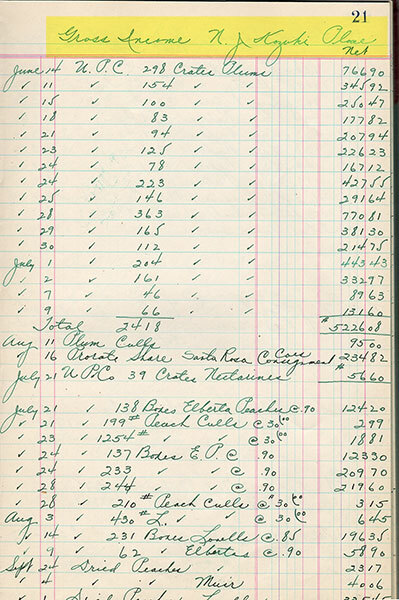 as well as preparing the income tax statements for both farms. 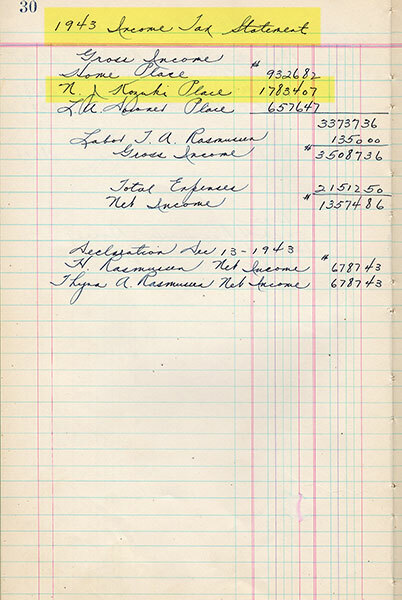 He did this through 1946, when he returned the farm to N.J. Kozuki upon his return. This is the last entry Kristi and I found. Helmer and Thyra when they were nominated “Mr. & Mrs. Sanger” after the town of Sanger, California where they lived. There are many stories within this story, and the sweetest is between Kristi’s fraternal grandmother and N.J. Kozuki’s wife. They exchanged letters all during the internment. Kristi’s grandmother, Thyra, wrote to her about the farm, and Mrs. Kozuki wrote Thyra all about the internment camp. These letters were found after Thyra’s death and returned to the Kozuki family. Kristi never talked to her grandmother again about this time in her life. In 1988, The Sanger Herald wrote a touching and expansive article about the Japanese families and this period in Sanger. It is very evident that the community was greatly saddened. Although some lands were taken care of and returned to the Japanese families, others would not be. Previous Post Oakland Sisters Sing! Thanks, Emily, for making a sad chapter in our history so personal and accessible. A must read for all of us who remember the Internment and for those who came later. A required reading for all History Docents. 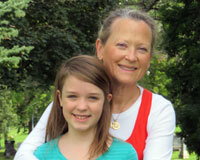 Thanks for sharing your OMCA and other experiences; love reading your blog! Thank you, Emily, for sharing these stories. First hand stories are the best. We don’t hear enough good ones about these dark years in our history. Thank you, Emily.